Wow! 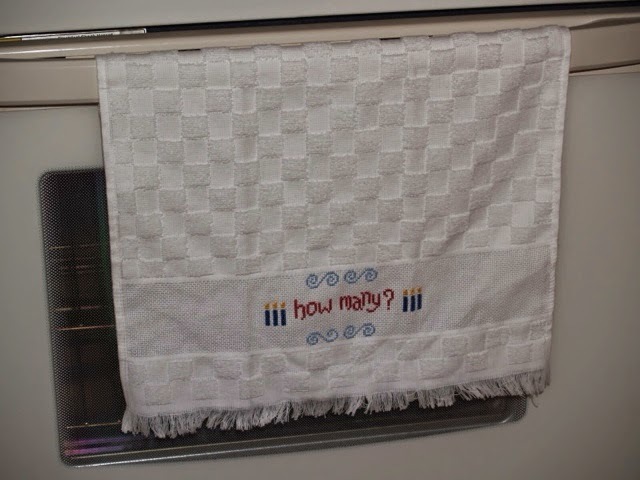 Yesterday's post about the cross stitched Spring table runner eventually led me on e trip down Memory Lane. Despite fighting a now 5-year-old to eat his dinner (pork chop and squash) I still felt a bit nostalgic for the days when he was smaller. 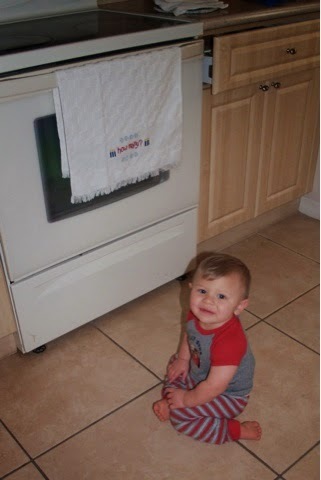 In February 2011, we celebrated Lil Monkey's First Birthday! It was a week-long affair since the Army took Daddy away the night before his birthday and brought him back the day after ... I know, perfect timing! However, my mom came to visit for a few days, we took Jamie to some of our favorite restuarants where he'd turned his charms on many of the female staff members and ended up with a variety of sweet treats. We celbrated with birthday muffins at playgroup and some of his adopted "aunties" showered his with more kisses than gifts - and there were a lot of gifts! The week before I decided I wanted to stitch something cute to commemorate that birthday and even the ones to follow, so to start with, I stitched this cute Toddler Pullover Bib with candles. He was determined to pull that towel down, but I was quicker! I also made him this Monkey towel and a matching bib. Looking back I feel like I had more time with a 1-year-old than I do now with a 5-year-old! 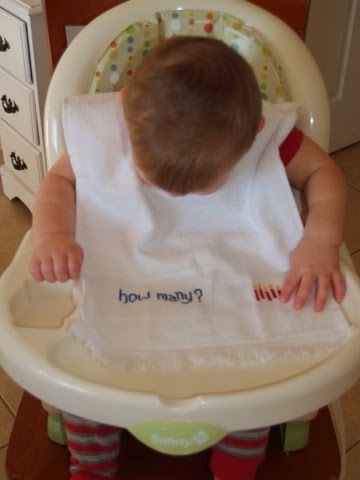 These bibs were a golden treasure. It was the kind that stretched and pulled over a child's head, and at this point we used those exclusively since he was a master at removing bibs. I was sad when we moved (Ah, Army Life ...) and could no longer find them. 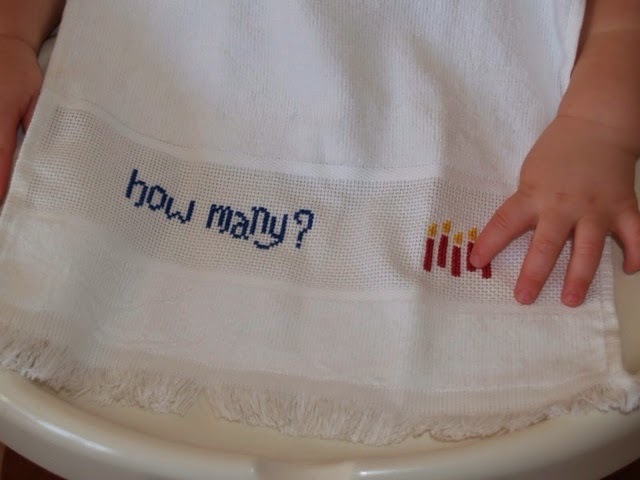 Until a few months ago he still used the towels (and those bibs) when he washed his hands. We really got some good long use from them. As I said yesterday, I really enjoyed stitching things to use in our home. 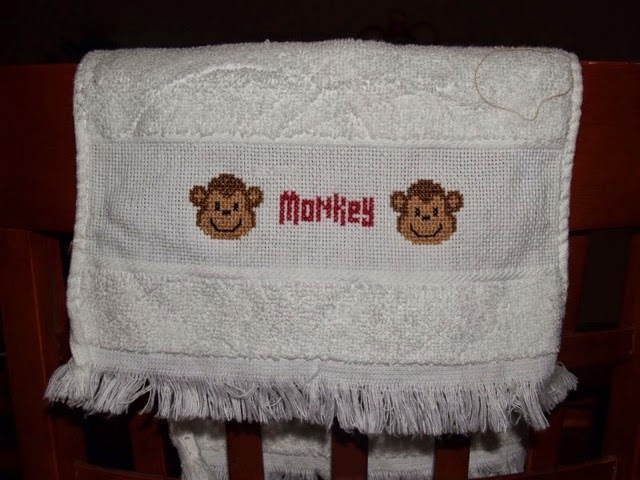 The Monkey pattern was given to my by my friend Meari @ Meari's Musings. You should visit her and see what wonderful projects she's been doing. Amazing work! I think the candles and wording were from a freebie pattern. I'll look for it and if I find it, let you know where I got it from. Both of these patterns were altered from the original designs and I loved how they turned out. Do you change designs, or follow the pattern explicitly?